Empetrum. (From Greek en, upon, and petros, a rock, referring to the habit; name first used by Dioscorides.) CROWBERRY. Empetraceae. Two species of low-growing, diminutive evergreen shrubs of heath-like habit. Leaves whorled, narrow. Flowers unisexual or rarely bisexual, small, solitary or clustered; sepals 3; petals 0; stamens 3; ovary 6-9-celled. Fruit edible, a glossy, succulent, globose drupe. N Temperate regions, S Andes, Falklands. Z3. Low-growing, heath-like evergreens, suited as groundcover in acid soils in exposed situations that approximate to their native moorland habitats. The glossy berries are of value to wildlife in conservation plantings. Propagate by softwood or hardwood cuttings or by seed; stratify in warmth for five months, then at 5ºC for three months before sowing. ROCKBERRY. To 15cm. Stems prostrate; branchlets hoary. Leaves to 3mm, narrow-oblong to linear-elliptic, rather erect. Flowers bisexual or with females also present. Fruit to 4mm, rose to red. Eastern N America. species hermaphroditum. Branchlets glabrous or brown-tomentose. Fruit black. N America, Eurasia. The name, variety hermaphroditum has been applied to hermaphrodite forms of Empetrum nigrum. BLACK CROWBERRY; CRAKE BERRY; CURLEW BERRY; MONOX. To 30cm, usually shorter. Branches decumbent, intricate; branchlets initially glandular. Leaves to 4mm, linear-oblong. Flowers small, sessile, unisexual; sepals rounded, concave, pink; filaments long, anthers red; pistil dilated, lobed, almost petaloid in female flowers. 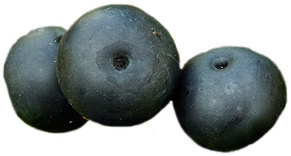 Fruit to 7.5mm, oblong-globose, glossy black. N America, Eurasia. The names, variety purpureum and variety rubrum are of doubtful application and in gardens may refer to Empetrum eamesii.